Identification: A perennial herb of moist or marshy sites, 1-2 meters tall, stem square or sometimes six sided, smooth or more often with short upward pointing hairs. As many as 30 to 50 branches emerge from a large root crown that becomes woody with age. Leaves are opposite or borne in whorls of three, sessile (attached directly to the stem), lanceolate to nearly linear 3-10 cm. Purple-magenta flowers are showy, 7-12 mm, 5-7 petals, on a terminal spike 10 to 40 cm tall, appearing from July through September. Styles and stamens are trimorphic. Stamens number mostly 12, alternating shorter and longer. Sepals, green outer floral leaves, are fused, forming a tube around ovary. 2n= 30, 50, 60. Mature plants can produce more than 2 million 1 mm long, reddish-brown seeds per year. A closely related exotic, though not invasive, species, L. virgatum, is established locally in MA and new England as a local escape from cultivation, and is distinguished from L. salicaria by its smooth stalk and leaves that narrow towards the base. Two other similar species are Northern willowherb (Epilobium ciliatum) and hairy willowweed (Epilobium hirsutum), which may resemble purple loosestrife seedlings and root sprouts, though in fact both are annuals and much smaller. Northern willowherb may be distinguished by its round stem and smaller, fewer pink flowers with only 4 petals; hairy willowweed is similar, but with long spreading hairs. Original Distribution: Two centers of distribution within Eurasia are known, one stretching from the British Isles, with its northern limit near the 65th parallel, including a portion of Norway's North Sea coast, through southern Sweden, Finland and into Russia, with the southern limit of its range extending through southern Europe, Italy, the balkans, and Greece to the Bosporus straits, then along the west, north and eastern shores of the Black Sea, and east to the west shore of the Caspian. Around the Mediterranean, some occurrences in northern Morocco, and coastal Algeria. The Asian segment of distribution, characterized by smoother, less hairy stems, is centered in Japan, extends east to the Amur river, and south through the lowlands of China into Southeast Asia and northern India. The arid lands of western Mongolia, China and Tibet form a large gap between the two segments. Current Distribution: From its Eurasian distributions above, L. salicaria has expanded in the northern hemisphere to a circumpolar distribution, and is now common in the temperate regions of North America, from New Foundland and Quebec to North Dakota, south to Virginia, Missouri and Kansas. Also found in scattered pockets along the Pacific Coast, and in the arid west as a weed of irrigation trenches. In addition, L. salicaria has invaded temperate subtropical areas such as eastern Ethiopia, New Zealand, Tasmania and Australia. Site and Date of Introduction: Most likely first introduced in the late 1700's to eastern North America in soil used for ships ballast. By 1814 it was reported growing in freshwater marshes near port cities from Philadelphia to Boston. Popularity as a horticultural plant, and the dispersal of seed in canal boat ballast on newly linked waterways marked purple loosestrife's spread into the interior in the 1800s. In the 1930's and later, irrigated farming and the construction of highways opened up the west to invasion. At this time the small initial colonies of L. salicaria exploded into large monodominant populations. Mode(s) of Introduction: Boat ballast was probably the most important vector for introductions across the Atlantic, with importation as a contaminant of raw wool in the mid 1800s, and by northern European immigrants for horticultural and herbal uses in the late 1800s, both potentially important sources of additional genetic diversity. Canal construction opened up the Great Lakes region to invasion again as ballast, but also by natural dispersal of floating seeds and propagules, as well as hitchhiking on wildlife. Highways were important for invasion of the Mid-west and Plains states, as seeds traveled in mud adhering to vehicles. Naturalization as a honey plant by beekeepers may explain some range extension in the middle and far West as well. Since 1941, superhighway construction, with stringent specifications for road crown height and drainage, created more opportunities for transport, and also created new habitat in the often damp roadsides. Large Federal water projects have also led to the construction of canals for the irrigation of some 3.8 million acres in the arid west, both creating more habitat along canal seepage zones as well as linking otherwise isolated natural habitat patches. These two government programs, together with the opening of the St. Lawrence seaway, have driven its spread of the last sixty years. Reason(s) Why it has Become Established: Four factors may explain its success. First, two of its principal associates in North America, Typha latifolia and Phalaris arundinacea, whose presence indicate habitat at risk of invasion, occur in a circumpolar distribution parallel to the range L. salicaria has attained, suggesting that it may have been pre-adapted to its North American distribution; similarities in the glacial history, climate, and soils between temperate North America and Northern Europe strengthen this view. Second, with its prolific seed production and the wide tolerance of conditions for successful germination it is well adapted to colonize disturbed areas. Third, its perennial habit, the ability to resprout from the root crown following defoliation, and morphological variability (i.e. the formation of aerenchyma to facilitate gas exchange in drowned stems), allow it to adapt to seasonal and other perturbations in a variety of habitats. Finally, once established its competitive dominance over native wetland species may be in part due to release from predators found in its native range, a release possibly accentuated by changes in allocation between defense of tissue and growth. The latter may explain why purple loosestrife did not seem to become a dominant invasive of wetlands until 130 years after introduction, as it would take time for selection to sort out genotypes that direct photosynthate from defensive allocations to growth. Ecological Role: In its native range, it is most often found in reed-swamps in mixed assemblages of Typha latifiloia, Phalaris arundinacea, Carex elata and others. Monodominant stands may form in response to disturbance, but these usually decay into mixed assemblages within a few years as other species, slower to recover, increase in abundance. While it appears in North America in communities composed of many of the same species it occurs with in Europe, the North American communities seem to become arrested in the L. salicariadominant stage of succession following disturbance; some stands in the eastern United States have shown no decay in 20 or more years of observation. Once established, Purple loosestrife will out-compete and displace other emergent wetland species, especially T. latifolia, and attain high densities without further anthropogenic disturbance. Pollination is by bees, and sexual reproduction, rather than vegetative growth, is the principal means of spread. Unlike the species it displaces, there is little evidence of exploitation by wildlife other than red-winged blackbirds (Agelius phoeniceus). Benefit(s): Horticultural varieties of purple loosestrife continue to be sold for ornamental plantings, valued for its showy flowers. While perhaps no longer used as a medicinal herb, extracts have shown antimicrobial properties against Candida albicans. Its tissues have also been shown to have hypoglycemic effects on rats and rabbits, and thus may provide the basis for drugs useful in controlling elevated blood sugar. 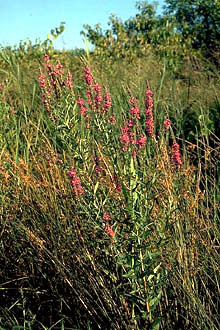 Purple loosestrife may also be useful as an indicator of contamination of aquatic environments by aquacultural use of antibiotics through its sensativity to phytotoxic compounds (antibiotics are frequently added to fish farm feed), and might play a role in remediation efforts as well: if the substances of concern are bioaccumulated, harvesting of L. salicaria biomass will remove the pollutants from the aquatic ecosystem. Threat(s): Since 1880 infestation of native habitat by purple loosestrife has been occurring at an exponential rate, and it has tripled in area since 1940. Increases in the frequency of and magnitude of human disturbance may be as much a factor as its competitive ability. L. salicaria primarily threatens wetland and riparian habitats characterized by slack water: Heavily scoured, shaded, isolated streams are relatively safe from invasion, as are mountain streams or those with narrow canyon walls. Cattails, canary reed grass, and other emergent wetland plants such as sedges or rushes are indicators that purple loosestrife could successfully invade. While it provides cover for wildlife, typically the biggest impacts cited are the displacement of plant species that provide food for wildlife. Indeed, the preference of muskrats for T. latifolia is one reason purple loosestrife tends to displace it. Other species reported to be effected include mink, a variety of waterfowl, and a rare species, the bog turtle Clemys muhlenbergi, although these impacts may be more speculative than documented. However, while L. salicaria may displace much native biomass, the abundance of each individual native species may decline only slightly, and its presence has even been associated with increases in local diversity in some cases. It also remains possible that after several years of minimal impact on species diversity, purple loosestrife may reach a threshold biomass after which it becomes dominant. Finally, invasion by L. salicaria may be the result of other factors that result in changes in species assemblage, rather than a principle cause of these changes. It is interesting to note that although declared a noxious weed in thirteen states, in other states it is still available as a horticultural plant from nurseries. Control Level Diagnosis: Medium Priority. Biological control agents require time to acclimate, and build up populations to reach effective density for control of host populations and dispersal. Rearing of control agents on artificial diets in a laboratory and subsequent release can accelerate this process, though there may be risk of retarding the process of naturalization, and it is expensive. The slow initial phase of control poulation growth, when individuals may not be readily apparent and effective densities have not been reached, can be frustrating for managers of invaded landscapes. Since in most cases, impact on local diversity are probably not as great as initially feared, and drastic or expensive physical and chemical control efforts may inflict more harm than good, and since the rate of spread in undisturbed habitats is low, protection of critical habitats from disturbance (such as water level manipulations designed for game bird management) is probably the most prudent defensive strategy, until populations of the released biological control agents reach densities and geographical spread. Control Method: Historically, burning, mowing, water level manipulation, and chemical defoliants have failed to control L. salicaria. Biological control by host-specific herbivorous insects from its native range is currently being attempted, with the goal of reducing L. salicaria from a dominant to a minor plant in wetland communities, as it is in Europe. Mowing within three weeks before anthesis may effectively prevent additions of new seed to the seed bank. Vegetative regrowth after mowing occurs from stems intact to the first node, or from lateral meristems growing horizontally from the leaf axil; root systems from which all stems have been severed below the first node do not issue new growth, although the elongation of lateral meristem, and the formation of adventitious roots on those stems, may be mistaken for shoot primordia developing on root tissue. Chemical defoliants have not been effective in preventing regrowth from root stocks, or prevented germination of new seedlings. 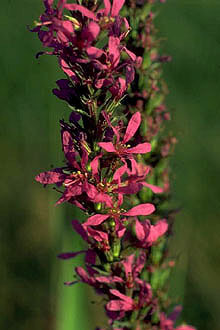 However, the broad spectrum, systemic herbicide Round-up (glyphosate), in the form permitted for use in aquatic ecosystems and branded Rodeo, has been shown to effectively reduce populations of purple loosestrife, but dormant root-crowns can persist and provide a basis for a resurgence. In addition, herbicides may kill desirable species, create space for noxious weeds to proliferate, with repercussions that may resonate through the food chain and effect the integrity of nutrient cycles and other ecosystem processes. Of 14 species considered host-specific to purple loosestrife, four have been introduced into the eastern United States as biological control agents: the leaf eating beetles Galerucella calmariensis and Galerucella pusill, the stem and root eating weevil Hylobius transversovittatus, and Nanophyes marmoratu, a flower feeding weevil. Both species of beetle are now established in 10 states and six Canadian provinces. While instances of reduction in L. salicaria have been reported and early indications are positive, most populations of controls remain in the establishment phase, at densities below those necessary to reach the program's stated goal of a 90% reduction in the biomass of L. salicariaover 90% of its range. Blossey,B., Rolf Notzold and E. Newton. 1998. The influence of below ground herbivory and plant competition on growth and biomass allocation of purple loosestrife. Oecologia. 113: 82-93. Blossey, B. and Rolf Notzold. 1995. Evolution of increased competitive ability in invasive nonindigenous plants: a hypothesis. Journal of Ecology. 83: 887-889. Cox, George W. 1999. Alien Species in North America and Hawaii. Island Press. Washington D.C.
Emery, S.L. and J.A. Perry. 1995. Above ground biomass and Phosphorus concentrations of Lythrum salicaria (purple loosestrife) and typha spp. (cattail) in 12 Minnesota wetlands. American Midland Naturalist. 134:394-399. Farnesworth, E.J. and Donna R. Ellis. 2001. Is purple loosestrife (Lythrum salicaria) an invasive threat to freshwater wetlands? Conflicting evidence from several ecological metrics. Wetlands. 21: 199-209. Gaudet, C.L. and P.A. Keddy. 1995. Competitive performance and species distribution in shoreline plant communities: A comparative approach. Ecology. 76: 280-291. Gleason, H. A., and A. Cronquist. 1991. Manual of Vascular Plants of Northeastern United States and Adjacent Canada. 2nd ed. New York Botanical Garden. Bronx, N.Y.
Lamela, M., I. Cadavid and J.M. Calleja. 1986. Effects of Lythrum salicaria extracts on hyperglycemic rats and mice. Journal of Ethnopharmacology. 15: 153-160. Malecki, R.A., et al. 1993. Biological control of purple loosestrife. Bioscience. 43:680-686. McAvoy, T.J., L.T. Kok and W.T. Mays. 1997. Phenology of an established population of Galerucella calmariensis (L.) and G. pusilla (Duft.) (Coleoptera: Chrysomelidae) on purple loosestrife, Lythrum salicaria L. (Lythraceae), in southwest Virginia. Biological Control. 9:106-111. McCaughey, T.L., and G. Stephenson. 2000. Time from flowering to seed viability in purple loosestrife (Lythrum salicaria). Aquatic Botany. 66: 57-68. Migliori, L., S. Cozzolino and M. Fiori. 2000. Phytotoxicity to and uptake of flumequine used in intensive aquaculture on the aquatic weed, Lythrum salicaria L. Chemosphere. 40:741-750. Rauha, J.P. et al. 2000. Antimicrobial effects of finnish plant extracts containing flavonoids and other phenolic compounds. International Journal of Food Microbiology. 56: 3-12. Stevens, K.J., R.L. Peterson, and G.R. Stephenson. 1997. Vegetative propagation and the tissues involved in the lateral spread of Lythrum salicaria. Aquatic Botany. 56: 11-24. Thompson, D.Q., R.L. Stuckey, and E.B. Thompson. 1987. Spread Impact and control of purple loosestrife (Lythrum salicaria) in North American wetlands. USDI Fish and Wildlife service. Washington D.C.
Twolan-strutt, L. and P.A. Keddy. 1996. Above and belowground competition intensity in two contrasting wetland plant communities. Ecology. 77: 259-270. Uva, R.H., and J.C. Neal and J.M. DiTomaso. 1997. Weeds of The Northeast. Cornell University Press. Ithaca, N.Y.
Weihe, P.E., and R.K. Neely. 1997. The effects of shading on competition between purple loosestrife and broad-leaved cattail. Aquatic Botany. 59:127-138. Willis, A.J., M.B. Thomas and J.H. Lawton. 1999. Is the increased vigour of invasive weeds explained by a trade-off between growth and herbivore resistance? Oecologia. 120:632-640.